I’ve now had a chance to talk with a number of people on a path of spiritual practice. All of us, or so it seems, began, as I did, in some form of contradiction. We felt broken, wrong, inadequate, and we thought spiritual practice would fix us. But spiritual practice isn’t about fixing anything. It’s about realizing that we aren’t broke and don’t need fixing. We aren’t broken and from the beginning never have been – at least, not in a way that needs fixing. We live in culture that constantly tells us we aren’t good enough. Get better, buy this product, this treatment, this school, this exercise, this method. It's difficult in such a culture to really believe that we aren't broken, that there is, in fact, nothing wrong with us. Spirituality is about learning how to remember the fact of abundance in the midst of the daily barrage of messages of scarcity. Even when intentional spiritual practice begins in self-contradiction, as it usually does, staying with it, slowly smoothes our rougher edges, and, like bird-watching, yields unpredictable glimpses of beauty. We don't get "fixed." We just gradually grow comfortable with who we are and always have been. At the end of Dr. Strangelove, the bomber plane is set to release its nuclear payload, but the release mechanism jams. Slim Pickens climbs down into the bomb-bay to fix the jam. He succeeds, and, unfortunately, the bomb is released while he’s sitting on it. 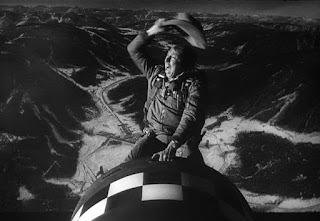 In the film’s most memorable shot, Slim Pickens is waving his cowboy hat and whooping as he rides the bomb down to his – and what will soon be the planet’s – destruction. But look at what Slim Pickens’ character is doing with his minute! That’s us. We’re all riding that bomb. Our time is so short before life blows up on us. There’s something very pure about this – just one chance at every minute. This is part 6 of 6 of "How I Learned to Stop Worrying and Love Spirituality"